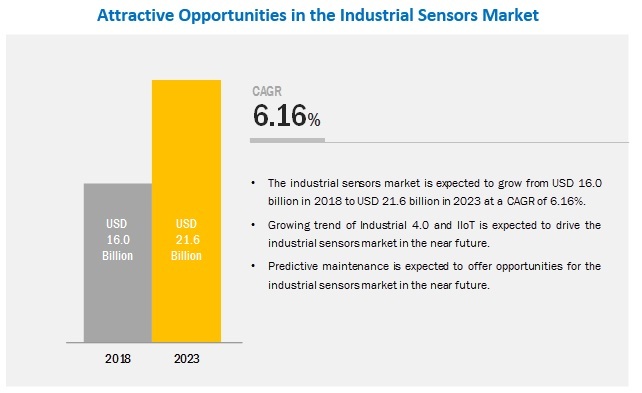 The industrial sensors market is expected to be valued at USD 16.0 billion in 2018 and is likely to reach USD 21.6 billion by 2023, at a CAGR of 6.16% during the forecast period. The study involved 4 major activities to estimate the current market size for industrial sensors. Exhaustive secondary research was done to collect information on market, peer market, and parent market. The next step was to validate these findings, assumptions, and sizing with industry experts across value chain through primary research. Both top-down and bottom-up approaches were employed to estimate the complete market size. Thereafter, market breakdown and data triangulation were used to estimate the market size of segments and subsegments. In the secondary research process, various secondary sources have been referred to for identifying and collecting information important for this study. These secondary sources include sensors journals and magazines, IEEE journals; annual reports, press releases, and investor presentations of companies; white papers; and certified publications and articles from recognized authors, directories, and databases such as Factiva, Hoovers, and OneSource. In the primary research process, various primary sources from both supply and demand sides have been interviewed to obtain qualitative and quantitative information important for this report. The primary sources from the supply side include industry experts such as CEOs, VPs, marketing directors, technology and innovation directors, and related executives from key companies and organizations operating in the industrial sensors market. After complete market engineering (including calculations regarding market statistics, market breakdown, market size estimations, market forecasting, and data triangulation), extensive primary research has been conducted to gather information as well as verify and validate the critical numbers arrived at. In the complete market engineering process, both top-down and bottom-up approaches have been implemented, along with several data triangulation methods, to estimate and validate the size of the industrial sensors market and other dependent submarkets listed in this report. After arriving at the overall market size from the estimation process explained above, the overall market has been split into several segments and subsegments. To complete the overall market engineering process and arrive at the exact statistics for all segments and subsegments, the market breakdown and data triangulation procedures have been employed, wherever applicable. The data have been triangulated by studying various factors and trends identified from both demand and supply sides, in consumer electronics and automotive industries. This research report categorizes the industrial sensors market based on core type, device type, industry, and region. 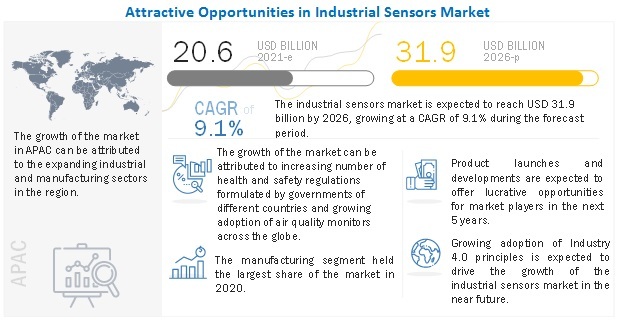 In this report, the industrial sensors market has been segmented by sensor into level, image, gas, pressure, position, force, flow, temperature, and moisture & humidity. Among all sensors, level sensors are expected to hold the largest share of the market throughout the forecast period. Level sensors occupy a huge share of the industrial sensors market as they are used in major applications such as manufacturing and process industries, semiconductor manufacturing, automotive manufacturing, and aerospace and defense manufacturing. Noncontact industrial sensors is a faster growing segment of the industrial sensors market. Increasing penetration of remote sensing and wireless sensing attributes to the growth of noncontact sensors in the market. The wireless sensors market is increasing due to factors such as increasing penetration in industrial automation applications; growing adoption of wearables in industrial facilities; emerging concepts, such as smart factory; and increasing applications in pharmaceuticals and mining industries and petroleum refineries. APAC is expected to hold the largest share of the industrial sensors market in 2018. APAC is the largest market for industrial sensors because of the presence of China in this region. China’s manufacturing output is the largest in the world. Therefore, China is among the world’s largest manufacturer and industrial producers. It is one of the major manufacturers of consumer electronics, automobiles, etc. 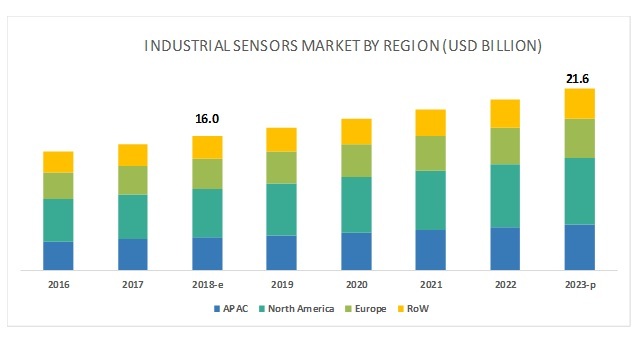 A few major players operating in the industrial sensors market are Rockwell Automation (US), Honeywell (US), Amphenol Corporation (US), Texas Instruments (US), Panasonic (Japan), STMicroelectronics (Switzerland), First Sensor (Germany), and Siemens (Germany). Rockwell delivers a wide range of solutions and services for applications such as food & beverages, life sciences, oil & gas, mining, cement, metals, pulp & paper, and water & wastewater. The company offers start-to-end industrial services to its end users. The available solutions offer the company an advantage over its competitors for increased growth. The company adopts both organic and inorganic growth strategies. In the last 3 years, Rockwell Automation offered 2 products related to the industrial sensors segment. In December 2017, Rockwell Automation launched a new line of proximity sensors for its industrial automation customers. This Allen-Bradley Bulletin 871FM miniature, metal, flat-pack, inductive proximity sensors are rugged, smart sensors built for harsh environments. They are enabled with IO-link technology and thus deliver more comprehensive diagnostic and parameter data to the controller over EtherNet/IP from the IO-link master module. This capability is helping companies in minimizing downtime and increasing productivity. In May 2017, Metso selected Rockwell Automation to deliver a global industrial Internet of Things (IIoT) platform that connects, monitors, and performs analytics for Metso’s equipment and services, resulting in improved efficiency and profitability for its mining and aggregates customers. In December 2017, Rockwell Automation acquired Odos Imaging to leverage 3D time-of-flight (ToF) technology for sensing and safety applications. The company will apply this technology for sensing products to deliver solutions to a broad range of demanding industrial applications, including automotive and general assembly, packaging and material handling, and logistics. Where will all these developments take the industry in the mid and long term? What are the emerging applications of industrial sensors? How advancements in Industry 4.0 is influencing the industrial sensors market? Which sensor type is expected to penetrate significantly in the industrial sensors market? Which industry will have the highest demand for industrial sensors in the next 5 years?